It doesn’t take bitter cold to freeze a water pipe. 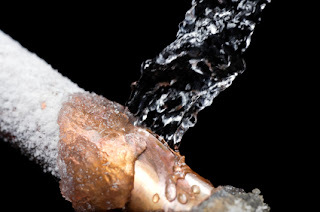 Temperatures only have to dip to about 20°F for a few hours for an exposed water pipe to be at risk of freezing. Insulate the walls to protect pipes. Seal any cracks in the foundation or walls that allow pipes to be exposed to cold air. If pipes are in an outside wall to reach a bathroom or kitchen, keep cabinet doors open below the sink to allow warm air to reach pipes and keep them from freezing. Call us! We can help make sure your home is properly air sealed and insulated.